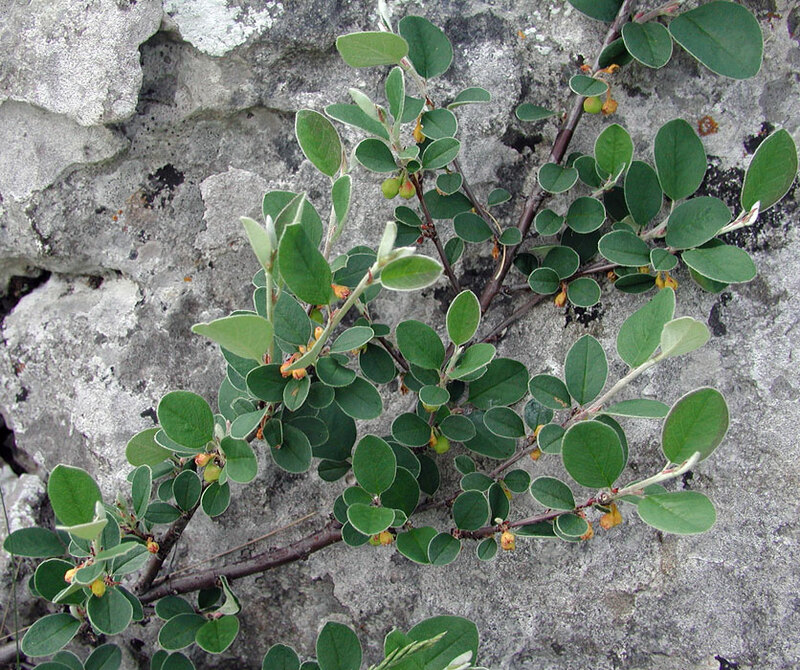 This plant is one very few remaining on the Great Orme and is the only place in the British Isles where you can find this very rare Cotoneaster in the wild. 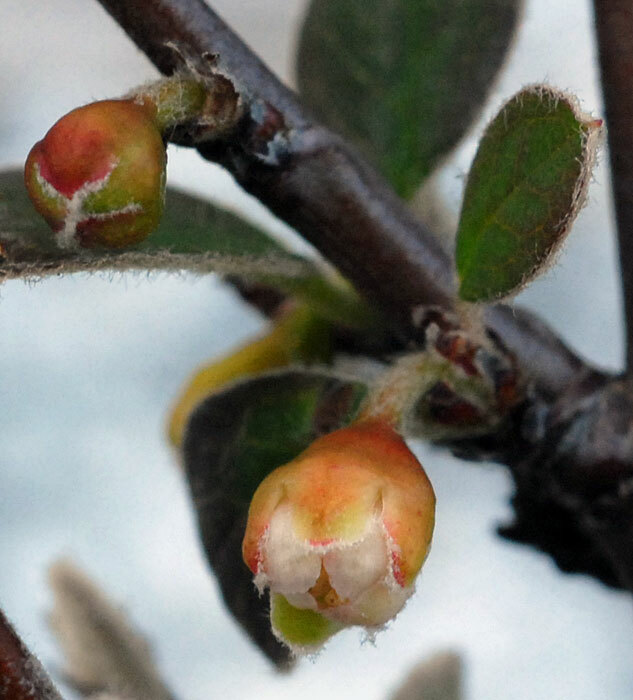 There are quite a few other Cotoneaster species on the Great Orme to put you off the trail, but this one flowers a bit earlier than any of the others and like most very rare flowers you'll hunt for it for years before you find it unless someone shows you where it grows. By mid May this one is usually in fruit. Access to this particular one is down a steep bank with Limestone rocks - always very slippery in the wet. It appears to be a stunted plant and grows out of crevices in a rock. In Victorian times this rare plant was much sought by collectors who paid local people to collect them. The population was much reduced and it is assumed that the reason why a few plants survived is that they probably couldn't be uprooted. The assumption is therefore that the population present on the Great Orme has survived from Victorian times at least. For some time there has been doubt about the taxonomy. 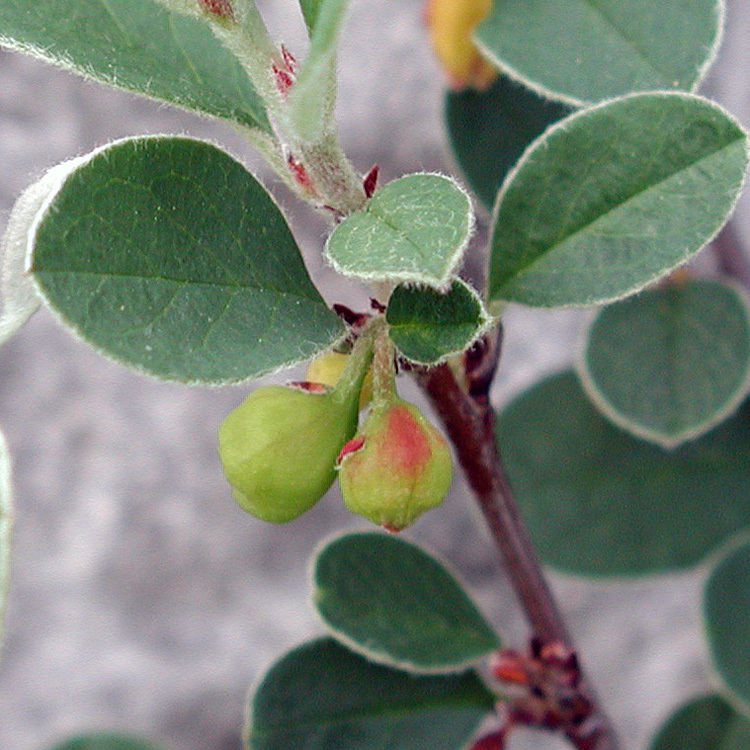 Some believe that this plant is not significantly different from the continental Cotoneaster integerrimus (its original name) and might be a sub species, variety or could even be a hybrid. 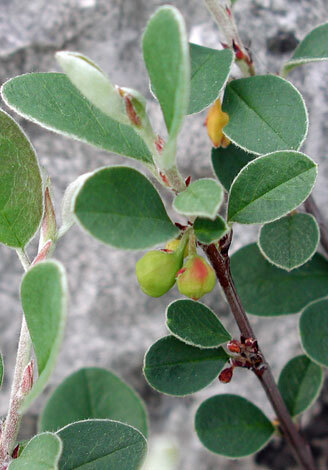 Since the plant is believed to be apomictic, hybridisation is unlikely. Anyway taxonomists are on the case and proposed genetic studies may or may not resolve the issue. Studies are needed on cloned plants but propagation has proved difficult in ther past. One of the local Orme residents has a beautiful specimen growing in his garden which is luxuriant and healthy - nothing like the bonsai versions in the wild and he has now managed to create a fine collection of young plants grown from seed. In 2008 some of the original wild plants were air-layered to produce clones of the few wild plants. The plan continued in 2009 with the remaining wild plants. This should create an exact genetic copy of the wild population if successful. However there is also a programme to reintroduce plants back into the wild on the Great Orme. This plan is controversial to say the least. 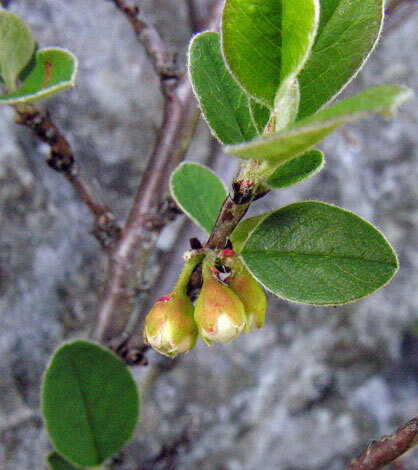 As if to illustrate the opposing camps, the currently (as at March 2010) internet published Biodiversity Plan for Cotoneaster cambricus says clearly that we should "..cease translocations into the wild pending outcome of taxonomic and genetic studies." This Biodiversity Plan is now obviously out of date since precisely the opposite action is being taken. This has been properly decided with full permissions and licences by those with responsibility for conservation of this plant. However the argument that we should not start gardening in the countryside until we know more about the plant's origins remains a powerful one. If this is a genuinely native plant and the conditions are right, the plant will perhaps eventually regenerate on its own but it might be an introduction in which case we surely wouldn't want that. Other more vigorous introduced Cotoneasters on the Orme are sprayed to keep them in check. However only two of the plants produce fruit now so perhaps the active conservation of what is perceived to to be an endangered species takes precedence. So do you believe that the re-introduction plan is saving the species for mankind and fulfilling obligations to maintain biodiversity or are we seeing the impatience of the human species which has a much shorter life span than the plants for which it cares? Answers on a postcard to the confused Countryside Council for Wales who denied all knowledge of these plans when I phoned them about this in 2007 and haven't responded yet (March 2010) to the idea that the published plans should at least reflect current practice. One thing is certain: if the re-introduction is successful so that the population of the Orme is a mixture of original plants and introductions, the field botanists of twenty years hence will still only want to see the originals. Just like the Silene viscaria planted at Stanner Rocks, the Lloydia serotina so conveniently living on a rock in Cwm Idwal or the rather manky looking Oxytropis campestris in the valley at Corrie Fee, such introductions will only be of interest to gardeners and some conservationists who have had their imaginations surgically removed. If field botanists, in truth the only people likely to be interested in seeing this rather dowdy plant, were happy to see merely an introduced plant they'd all form a queue at Kew.